Development of Village Monsters has really hit its stride in these early days of 2018. January was perhaps the most productive month of my entire life; it's no exaggeration to say the game has changed more in last month than the previous 3 months before it combined. In today's update we're going to take a look at many of these changes. Toward the start of the month I created a new dialogue tool to assist me with writing all the text in the game - and boy howdy, there sure is a lot of text to write! There are many monsters to meet and befriend in this village, and I want to ensure each of them has something to new and relevant to say every time you talk to them. It's a big effort, but it's also a rewarding one. Part of this process has included making "character sheets" for each villager in order to better break down their personality traits, goals, and relationships with each other. This has already become one of my favorite parts of creating this game, and I plan on making some of this info available in your in-game journal. Beyond new text I've also made major improvements to the dialog box itself. Some elements have been rearranged or expanded on, and the box now appears at the bottom after a little slide animation. But perhaps the biggest change is the inclusion of "villager flair" - each villager will now have their own slightly modified dialog box. This is yet another way of allowing their personalities to shine through. A sense of progression is a major appeal of playing life sim games like Village Monsters: think of how rewarding it is to expand your home in Animal Crossing, or how vital day-to-day progress and improvement is to the flow of Stardew Valley. Thankfully, this past month has allowed to make big changes to the progression elements of Village Monsters. For example, the relationship system for befriending your monster pals is now up and running. It's still in its most basic form, but you'll be able to track your friendship with a monster based on the number of filled arts below their portraits. Each villager has 3 hearts, but each heart has multiple "levels"
For more tangible progress, you no longer start the game with a house of your own. Instead, you enter the town as an outsider, and you'll spend your first few days renting a room at the local inn. Save up enough money and you can move out into your own place with your own furniture, but, well...it's still a bit of a fixer-upper. 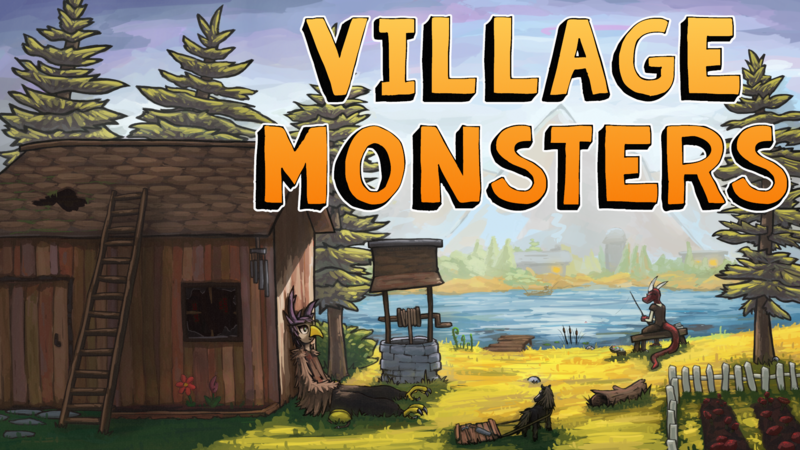 Fixing, improving, and upgrading your homestead will be a major part of your daily life in Village Monsters, but this loop goes beyond your own small slice of the world. The village is facing some hard times when you first arrive, and many villagers have suddenly gone missing while exploring the world outside the village walls. It's up to you to help fund repairs, place decorations, and find lost villagers out in the world. This may be a village of monsters, but it's your home too, and I hope you'll find the time and effort to make it a better place. In the last update I mentioned that big changes were coming to the village and surrounding outskirts. Like with progression I definitely want you all to experience these changes yourself when you explore the village in the Beta release in March or the final version at the end of this year. Still, I can't leave this post without giving you something! Here are a few shots of some of the new and improved areas around the village. of course the dark dwarven bros live in a dark dwarven fortress! That'll do it for this update. Until next time!